Empathy is an understanding of the feelings of others. Essential for pro-social behavior, empathy paves the way for healthy friendships, connected relationships, compassion, and so much more. According to a new study, the empathy capacity in children could be increased through exposure to music. In conjunction with Ian Cross, also a music faculty member at Cambridge, Rabinowitch analyzed a total of 52 children, 28 girls and 24 boys, between the ages 8 and 11. The children were split into three groups randomly. One group played interactive musical games weekly. A second group participated in written text and drama activities weekly. The third group had no activity participation. The group of children who participated in the musical activities played games that encouraged imitation and sharing of musical goals. For example, one child would do something musically and the next child would imitate it, and the next would imitate the second. 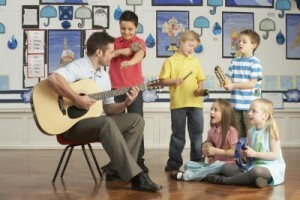 Children playing musical instruments were also encouraged to attend to other children. Games of these sorts create “entrainment” within the group, a process in which players become rhythmically attuned to one another during a musical game. Rabinowitch wanted to determine if strengthening or refining these activities in a group context could actually focus and strengthen these qualities in an everyday context, particularly where empathy was concerned. To test this theory, children from all groups were given an empathy test before and after the study period, which lasted a year. The test, known as the Bryant’s Index of Empathy for Children and Adolescents, contains 22 hypothetical questions like, “If you saw a friend had fallen over, would you go over and help them up, soothe them, or laugh?” Another test, a nonverbal test of matching faces, was also given to each child. “Overall, the capacity for empathy in children that participated in our musical group interaction program significantly increased,” Rabinowitch said. This effect was not seen in either or the remaining two groups, which actually surprised the researchers, considering the fact that the drama children were given storytelling games that were very similar to the musical activities. Rabinowitch stresses, however, that the lack of effect does not rule out a lack of increased empathy in any other group, particularly the drama group. Joe Landon, executive director of the California Alliance for Arts Education, says that he’s not surprised by the study results, but definitely intrigued by the way it underscores the effect of the arts on children. Sacramento Philharmonic tubist, Julian Dixon, who leads similar activities as a part of the orchestra’s outreach program, says that he, too, has experienced this increase in empathy capacity in children. In light of this study, schools may start to question whether or not the music program should take funding cuts when budgets are pressed to the max. It is important, however, to understand that the musical group participated in group music projects, not individual music projects – an interesting detail, according to Ross Thompson, professor of psychology at UC Davis. Jay-Z and Beyonce Vacation in The South of France With Blue!